Living in Baroda paid off a little more when I recently got the opportunity to travel to Ahmedabad and Mumbai for weekends’ play of test matches against England. It was my first trip to the cricket grounds in either cities. 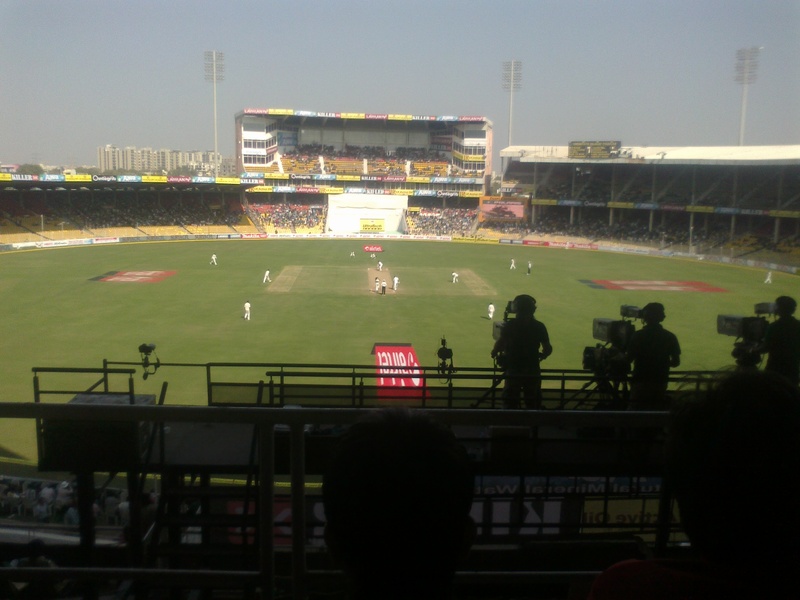 In this post, I’ll share my experience of watching cricket at these arenas. India vs England, 1st Test Match, Sardar Patel Stadium, Motera/Ahmedabad. It was a 3 hour trip by bus, or a two hour trip by car to the stadium. There were no online ticket sales. So, I had to get those tickets at the stadium ticket counters. There was car parking inside the stadium premises, but the day I went there in my colleague’s car, the police said we couldn’t take the car on the street leading to the stadium unless we had a ticket. Funny, because we can buy the ticket only when we reach the stadium. We had to hence park the car elsewhere and pay people living nearby to guard the car. Anyway, we could get tickets for some good seats at the Adani Pavilion, for seats right over the dressing room and just behind the cameramen. The Gujarat Cricket Association has a rooster as its logo. You will laugh at that till you reach the security checks. There were 4 layers of security checks, and you will feel violated every time. And you will have to chuck away all the coins you carried on you before entering. The seats didn’t seem new, and they surely weren’t cleaned every evening. The crowd built itself up and before the first session ended, the Pavilion stands would be more than 80% full. The ones on square were less than 50% full. That seemed odd, because I could see a huge queue of people waiting for those tickets. The stands above the commentary box were less than 30% full because the sun shone on them almost all day. In my stands, we had to climb down to a walkway for food and drinks. Can’t have a great meal out of samosas, popcorns, sandwiches, burgers, puffs, bhel puri, icecream, soft-drink and water, though. But it was fine. Jamtha/Nagpur served biryani and stuffs, which was more filling. I didn’t find that here, so was a bit disappointed. You will land in a bit of trouble if you had too much to drink. The toilets were poorly maintained there. The stadium had only one exit. So, at the end of a day’s play, you would have to walk atleast 1 km along dusty pathways to exit the stadium from a single 5 m wide gate. And then, the hundred autowalas will refuse to go to the exact one place you want to go. (the foreigners would pay him much more, why would he take you on board?) So, I had to walk another km before getting hold of a tuk tuk. It was nice to be able to easily get entry (tickets and all) to the stadium, but it wasn’t quite great an experience inside it. 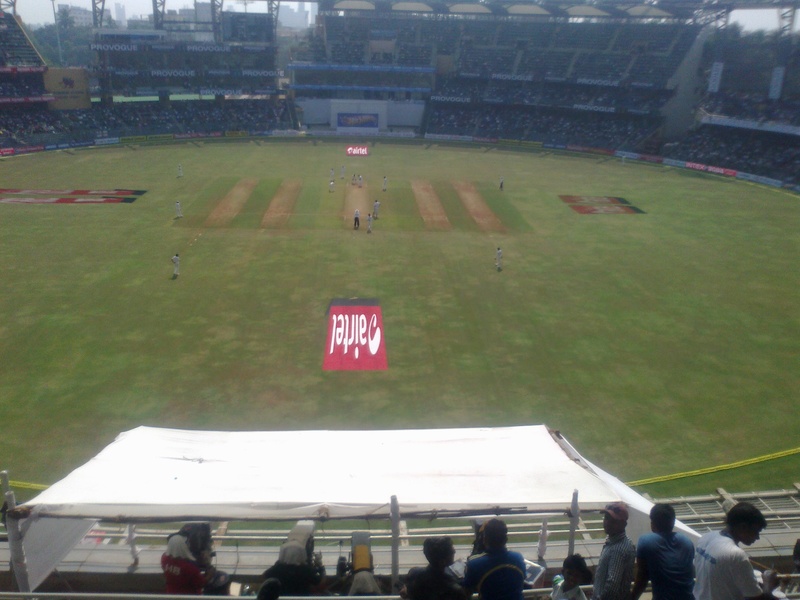 India vs England, 2nd test, Wankhede Stadium, Mumbai. I had made a weekend trip to Mumbai for the 2nd test at Wankhede. It was an overnight train journey away from Baroda. You could get the tickets to the game online or at the MCA windows near the stadium (which had long queues). Even if you bought it online, you had to come to the stadium to collect the tickets though, and I heard from my friend that even that was a long queue, which was later sorted out to make it shorter. I reached the gates an hour before play with my friend. We had two layers of man handling security checks, and we were in. We were in level-2 of the North Stands (opposite end of the ground to where the dressing room was), and would later move to level-3 when the sun shone down upon us. Level-2 was near the press box, and Level-3 was right above the press box. Some of the liveliest people were crowded in the North Stands. Almost every cheer that ringed through the stadium emerged from the North Stands. The most noticeable one was the “PU-JA-RA” chant that echoed across the stadium. I was at Garware Pavilion (which was near the dressing room) for one session, and from there you could hear the “PU-JA-RA” chants from that North Stands section welcoming Pujara to the middle. That was one of the most amazing moments I’ve been a part of. The other stands had drums shooting out bhangra that had people around it dance. The Barmy Army was larger in number at the Mumbai test than they were at the Motera test. So, the English team got some good support from them. Indian fans were quite respectful with them too. Alastair Cook and Kevin Pietersen got standing ovations from the entire ground after their tons. And a lot of those fans mingled along with people freely. I didn’t feel like talking to a single stranger at Motera (or Nagpur, for that matter). But, here I could talk to some. The crowd also let the Indian bowlers know of their horrendous bowling when they had to. Harbhajan Singh got irritated once and complained against some fans, who (I heard) were evicted from the stadium. This, after Harbhajan was totally okay with fooling around with the Motera crowd which got him to happily wave at them, crack jokes with his teammates, kick stuffs like a pro footballer, etc, while he was a water-boy. The crowd there loved the performer that he was. Mumbai crowd did not like his performance at Wankhede, and he did not like that attitude. Food was served at your seat. Samosas, rolls, cold-drinks, ice-creams, pizzas! Water was available in the walk-way. And what’s more – you can go out of the stadium and get back in any time. So, people could go out to a foodie street near Wankhede and have their fill. A couple of stationery shop owners on that street had the “Why did I not open a snack bar instead?” look on their faces during the lunch hour. And drink all you want, the toilets are fine at Wankhede. The foodie streets had some wonderful juice and soda shops! There were multiple exits which would drop you are various points around the Churchgate station and Marine Drive. So, the crowd was able to disperse in multiple directions and spread away. Many went to Marine Drive, some went to food joints around the place. Others boarded trains at Churchgate or taxis and buses outside. There wasn’t the flood of exiting human beings that was seen at Motera. I was exhausted after the two days at Wankhede, both of which were full of fun. It was a wonderful experience there. Even if India had a bad day, being with that crowd would help keep your spirits up. Looking ahead to watching more games, at new places. Would love to be at Wankhede for many more test matches. So, cricket returned to Indian TV screens. And how! Some of us will say that cricket never left our homes. However, the preceding three months had seen a ODI series against Sri Lanka — Yes! We needed those like Cherrpunjee needs rain, thanks — and a lengthy series of T20 games. To me, these were months of intense dullness, induced by games that lacked substance or context. Indolent indifference and unbearable ennui resulted. It was therefore refreshing to see a cricket match unfold like cricket should; the match told a story of aggression, calm maturity, deceit, courage, disintegration, foolishness, bravado, determination and perseverance. It was also a story of one captain’s despair even in victory. This was a story of Sehwag’s aggressive return to ‘form’, although in his case I am not sure what the word ‘form’ even means. His art defies form and sometimes, a consistent narrative. We can’t be certain that a lack of runs worries the man, just as it is hard to ascertain whether the accumulation of a substantial number of runs makes him any more content or confident than he already appears to be. He smiles benignly through pleasure and pain. We too must, perhaps. This was a story of a young man’s calm maturity. Like Rahul Dravid before him, Cheteshwar Pujara appears to be the sort of guy every girl would want to take home to meet her parents. One girl already has, and the parents have apparently approved. It is inevitable that Pujara, Che as he is referred to by his growing legion of fans, will be compared to Rahul Dravid. Pujara presents a compelling case against genetic cloning; it would seem that this is just not necessary! The score was 1-134 when Pujara started his innings, which meant that he was able to play freely and without much pressure; at least initially. His calm maturity was evident however, after four wickets had fallen for 283 runs. He held the innings together after that point and slowly accumulated his runs with Yuvraj and Ashwin. In the end, it was hard to believe that he had made as many runs as he had; he was surreptitiously effective. The post match analysis seems to have omitted one significant point in the game when Jonathan Trott seemed to claim a catch after he had virtually slept on the ball. It is hard to believe that this professional cricketer didn’t know he had grassed the catch. It was as funny as it was, in my view, an atrocious piece of gamesmanship. I can’t imagine Harbhajan Singh, for example, getting away with a professional foul of that sort. The match referee, however, turned a blind eye to it. This was also a story of Altastair Cook’s courage, Kevin Pietersen’s disintegration and Ian Bell’s foolishness. Cook showed tremendous application in both innings. The England captain would have watched in agony as Pietersen and Bell, his illustrious teammates, lost the plot through a combination of foolhardiness and needless bravado. In the absence of effective technique to combat the turning ball, instead of application and patience, we saw brain fuses from Bell and Pietersen. But in both innings, Cook played with enormous pride and resolve and this will have given the England camp some comfort. There is nothing worse than a disintegrating captain of a team that loses badly. He might be boring to watch, but Cook is certainly emerging as an extremely determined and effective a player. This Test match wasn’t as bad for England as the scorecard will have us believe. With a better team balance and greater application, England can bounce back in this important series. And I feel they will. After the match, Dhoni was criticised for his statements against pitches. The Times of India, in its opinion section adjoining the piece on the pitch, inferred that Dhoni “seems to be letting the thirst for revenge get the better of his cricketing sense”. Right. ‘This criticism of pitches is becoming a pattern with Dhoni’, some people yelled on late-night TV chat shows. ‘We must prepare sporting tracks’ yelled someone else. On another TV show Maninder Singh just yelled. What Dhoni has asked for seems perfectly reasonable to me. What we want to see is turn and bounce on a wicket. Further, his point is that it should be fine for a wicket to turn right from the toss so that the toss does not become as vital as it currently is. If the match then ends in three days as a result of this turn and bounce, it must be down to the incompetence of the players and nothing else. Teams from England and Australia have come to expect car loans for single mothers and pitches that turn in India. My sense is that the words ‘dust bowl’ and ‘rank turners’ have become disparaging in our vocabulary because of the disdain imputed through their repeated usage. However, that is the nature of wickets in India. The soil conditions dictate that wickets will turn. To ask for anything else (or to artificially provide anything else to visiting teams) is akin to hating Paris because it does not have the Sydney Opera house. That is what I have been saying for the last few weeks repeatedly: Hit me, I deserve it… H-MIDI. Team India went to face England in a hugely important Test series. To me, this was an important series not because the #1 Test Rank was at stake. Like trousers, shoes and underwear, rankings come and go. Rankings are not a reflection of the state of health of a nations’ cricket. To me, the ICC rankings are as important to the game of cricket as the ICC itself is. In other words, the rankings are irrelevant to me. It didn’t matter to me when India was #8 in the table. (Was it ever #8 in the rankings? Do I care?) It mattered even less to me when India was #1 in the rankings. And that India was! I know that. As far as I am concerned, when the ICC starts governing the game properly, perhaps I might start to care about the rankings it puts out. It does irritate me, however, when Michael Vaughan and Johnathan Agnew and the rest of their tribe preen about the England team. Their preening is irrelevant. The manner of their preening grates. Subsequent to his unfortunate “Vaseline” comment, instead of retracting it, Vaughan asked me to develop a sense of humor. Sure, I can develop a sense of humor or even buy one in the local market. That would be way too simple! There are a few larger issues at play here in my view. Do not get me wrong! The English have won the bragging rights. Of that I have no doubt and I will not deny England her brag-rights. England has played outstanding cricket that has been as resolute and dogged as it has been brutal and attractive. England has bullied India in this series and I am willing to call this spade a shovel if necessary. England has been the better team in this series… by a long distance. So the English have the right to preen and brag. But no team and no press has the right to trash talk and belittle. In the last few weeks, writers like Stephen Brenkley and Steve James have made Malcolm Conn look like Mother Theresa! The English cricket press has made me yearn for the decency and integrity of the Australian cricket press; and I thought that those were two adjectives I would never ever use to describe the Australian cricket press! There have been many statements about India not being deserving of the top of the tree ICC ranking. In this article, the author tries to disentangle the chest-thumping hyperbole from the ground realities. My hypothesis is that one cannot go into such paroxysmal manifestations of extreme hysteria if there is no undercurrent of unresolved issues. But did I expect anything else from the England press? After all, the sub-continent took ‘their’ game and became better at it than England has been for a long time now. My view is that England had been itching to get back at teams from the sub-continent. Particularly India. If Pakistan had taught the sub-continent flair, and if Sri Lanka had taught the sub-continent aggression, India had, after all, combined flair and aggression in a package that included cash! The power-base had irrevocably shifted. England itched at the opportunity to punch back on the field and off it. I had hoped that England would not resort to the off-field histrionics that it has resorted to. But I was wrong. Hit me, I deserve it (H-MIDI). To me, this series was important, not because of the ICC rankings, but because it would probably (almost definitely) be the last time we see Rahul Dravid, Sachin Tendulkar and VVS Laxman playing together for Team India in England. These three are the Tireless Trinity, which is a subset of the Famous Five, which itself was a super-set of the Fab Four. For Dravid and Tendulkar, England has a special significance in their careers. It was here that a young Rahul Dravid made his debut for India. It was here that a curly-haired Sachin Tendulkar really hit his straps. 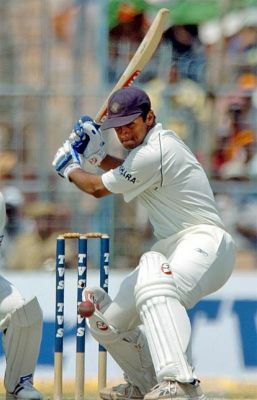 After playing 9 Test matches for India and after showing tremendous promise, it was at Manchester, in 1990 that Tendulkar scored his debut Test century; a brilliant century in the second innings. I watched that innings and have followed his career closely ever since that day. He deserved a rousing farewell to England. He was denied that. This series was important to these three players. I had hoped — nay, expected — that the younger India would carry these players on their shoulders; just as Virat Kohli said they wanted to, “for Sachin”, on winning the World Cup! The younger players had a responsibility to afford the “Tireless Trinity” that farewell. This tour would tell me that, in the absence of a few key players, India would still be able to be tough and uncompromising in its pursuit of excellence. I expected the younger players to stand up and deliver. I was disappointed in the end. But was it right for me to have these expectations in the first place? So, hit me, I deserve it (H-MIDI). What matters most to me is how a team plays the game! The West Indies played the game incredibly well as champions. From the early 1970s to the mid-1980s, West Indies was the most attractive team going around. They played with an incredible flair, fun and poise. They were entertainers first and champion players next. I admired her players and knew their dates of birth by heart! I admired them more than I did, India! Later on, the Australians started taking over. The transition was slow and painful. In the 1990s the Australian side was the one to beat. In my view, however, except under Mark Taylor, Australia played the game badly. I hated her teams because of the boorish behavior that accompanied her wins and, more importantly, her losses. India’s reign at the top has been too short for this team to develop a championship habit and character. However, the team under Anil Kumble and MS Dhoni had tried to play well; tried to play attractive cricket; correct cricket. MS Dhoni even publicly reprimanded and rebuked his star bowler, Sreesanth, for his antics whenever he crossed the line. India played like a champion side till Dominica happened. Since then, it has played like a tired team that did not want to be on the park! The first signs of something amiss came at Dominica. For me, this was an eerie mile marker on an important journey. Dominica was, to me, less about the handshake. To me, it reflected the mood, the state of mind and state of readiness of players in the dressing room. It told me that the players wanted to go to the comfort of the Hotel room. It told me that the players were a fatigued lot. Dhoni had already mentioned his Hotel room in the previous Test match in his post-match interview. It seemed to me that that was his refuge; his escape from it all. The draw offer talked to a captain’s (and his team’s) intent in a fight. To me intent is a powerful phrase. It talks to more than just aims, purpose and objectives. It talks more to the state of one’s mind at the time when one carries out an action or makes a decision. It talks to a goal that is so firmly affixed that one can only approach it with an uncompromising, unwavering and an unrelenting desire. To me, Dominica had compromised the captain and his team. I should have reset my expectations for Team India from the England series right then and there. I did not. I hoped that the players that had sat out the West Indies series would bring a freshness to what I saw as a mentally fatigued dressing room. I was wrong. So, hit me, for I deserve it (H-MIDI). I was aghast when I read this. Competitive? Is that what he said? Is that what he actually meant? Competitive? As in “we will put up a good fight”? But that is not champion speak? Surely! “It cannot be,” I said to myself. I ignored that warning sign too. I said to myself that India will be more than competitive. India will more than just “make up the numbers and rock up on the park”. I convinced myself that Team India was going to win, regardless! After all, it always has overcome the odds in recent series! So also this time. Did it? No. So, hit me, for I deserve it (H-MIDI). India went into the England series with a few players resting from the extreme physical turbulence that the IPL represents. The IPL is an unforgiving tournament. It is not just about 16 games in 45 days. It is just that IPL games come at players with remarkable regularity like a steam train that just will not stop. And to lay the blame for India’s poor showing at the doorstep of the IPL is just being too lazy! However, I am also saying that the IPL is an unrelenting, uncompromising and brutal menace. The franchise owners are investors first and their first and foremost responsibility is to their shareholders. They must want the best that their investment can get them. To the investors and franchise-owners, return on investment cannot be unimportant! And if that means Sachin Tendulkar has to do away with an hour’s sleep (or more importantly, an hour’s worth of throw downs) in order to attend to ‘sponsor commitments’, then, that is the way it is. Sponsor commitments will win over cricketing logic! It is not about that at all. It is just that in those 7 weeks, a player does not have the time to focus on the basics of his game. If Irfan Pathan has a problem with the positioning of his right arm while bowling, the 7-week IPL is not one in which he will get this rectified or even looked into! The team is looking to put its players on the park; not to work on rectifying errors that may have crept into his game. The IPL just does not afford a player the opportunity to think, plan and act in a strategic manner, particularly with respect to his fundamentals. There is no wonder, therefore, that the IPL converts minor niggles into major injuries. But I am to blame for this too. I go to IPL games. These games represent 3 hours of “paisa vasool” (return on my investment!). The games represent leave-your-mind-at-home fun. I see the advertisements that are on TV when IPL games are on! I buy the products that are advertised during the IPL. I am responsible for providing the BCCI with the cash it earns from the IPL! So, hit me, for I deserve it (H-MIDI). Every team aims to be better than it was. India too. Of that, I have no doubt. There is no reason to doubt the commitment of the Team India players. They play with pride and determination. This team has been around for far too long to fall together in a heap at the first sign of trouble. But what we fans must realize is that every other team is looking to improve too. Every other team wants to close the gap on the best team. Take injury-management: England presented themselves as an excellently prepared unit. On the contrary, India presented themselves as a ragged unit that was mentally and physically under-prepared. England had a few injuries too. The replacements were not only adequate. In the case of Tim Bresnan replacing Chris Tremlett, the replacement was actually better! Not only that. The fact that Chris Tremlett was not going to be able to play was transmitted way in advance of the Test match in which Bresnan played. The under-study was ready; he was prepared. The Indian injuries left the team bereft of options, ideas or purpose. India’s approach to injury-management was immature at best and cavalier at worst. This is a point that has been brought out sharply by other authors. I do not know if this cavalier attitude percolated through the team. And it is incorrect of me to vault into the realm of speculation. However, given the inexplicable manner of the violent capitulation, we are necessarily into the realms of speculation when all other logic fails! India has always tended to rush its players back from an injury-inflicted lay-off straight into important games. In this series against England Gautam Gambhir, Virender Sehwag, Sachin Tendulkar and Zaheer Khan were moved into important matches without adequate testing of match fitness. But the injury that hurt India the most was that sustained by Zaheer Khan. Zaheer Khan is the most important bowler in the team for more than his bowling. He is the commander of the bowling attack. He plans out the bowling. He maps out strategies. He is the go-to player when things do not go right. And when he limped off with a strained hamstring on the first day of the series at Lord’s, it was as though the team had no Plan-B. The air was sucked out of the team as well as the blimp that hung over it. The team was reduced to a rudderless ship when it came to the bowling. And it looked like that malaise had affected the batting too. There were no plans. There was no team. We only saw capitulation after capitulation. So, while it is easy to admit that England played a superior style of cricket, it is impossible to unpack the capitulation. The way the team played from the moment it faced its first injury is best captured by this brilliant article by Sriram Dayanad who endured much of this pain first-hand. But every time there was a setback to this team, I continued to believe. I continued to be positive. I requested and pleaded with everyone to be positive. After all, this team has risen from the dust in the past; none more gruesome than Sydney in 2008! After all this team had risen from 0-1 and 0-2 deficits to claim victory. I had to keep believing. I had to keep the faith. Instead of admitting the inevitable after seeing the well-oiled England machinery and instead of admiring the thoroughness of England’s approach, I kept hoping for the miracle bounce-back. Did that miracle happen? No. So hit me, I deserve it (H-MIDI). This tour represents an important marker in Team India’s journey. MS Dhoni has been tested thoroughly. So far, in my books, he has failed the test. But my view is that he is too good a player and too good a leader to let this be anything other than a big learning experience for him. Dominica was completely in his control. I still believe he stuffed it up. Since then, everything has gone pear-shaped for him. Sometimes you just make your own luck. He chose not to. From then on, hurt and pain have been inflicted on him (and his team) by a team that was just better prepared. His cause has not been helped by the fact that an anti-BCCI feeling has continued to torment this tour. And in the midst of an awesome revival by England at Nottingham, he was tested by the “Spirit of Cricket” and by Nasser Hussain’s Underpants! In all of this, the DRS-cloud has just not gone away. The BCCI does not deem it necessary to have a media manager to explain its position adequately. The BCCI position can be explained with remarkable aplomb! All it takes is the appointment of a suave, well-informed, articulate media manager. Just look at the VVS Laxman “Vaseline” decision and the Rahul Dravid “Shoe Lace” decisions in this series itself! One can point to the BCCI stance just on the basis of these two decisions! And if that fails, all that the media manager needs to do is brush up on the incredible amount of work that someone like Kartikeya Date has put in to accumulate a defense of BCCI’s position on DRS! But then the BCCI does not seem to have any credible media policy that adequately manages its position on any aspect of its approach to the game and its responsibility to the game. Instead the BCCI has determined that it is sufficient if it pays two gentlemen — no doubt extremely honorable gentlemen — an awful lot of money, thereby, abrogating itself of its responsibilities at opinion management and opinion leadership! The team was burdened with bearing the cross of the collective envy of others who saw the team as an extension of a rich and boorish Board. The team was burdened with having to explain the stance of its Board on most things to do with the game on which the Board has a legitimate view! All this when one of the honorable men honored his commitment to his employer by way of a most undesirable spat on live TV that was straight out of a B-Grade Bollywood movie! But despite these limitations (or perceived limitations), I will continue to believe in this team. Heck! I believe now that this team will win the 4th Test at The Oval! And if it does not, well… Hit me, for I will deserve it (H-MIDI). But remember, the more you hit me, the more I will believe in this team. For I always have! I like former England captain Nasser Hussain. He played the game with passion. He has a sharp mind and brings it to the commentary box. He has an excellent sense of humour and gets most things right most of the time. He has played 96 Test matches for England too. He told Ravi Shastri this. Good bloke. Nasser Hussain. Top bloke. Nasser Hussain wants DRS implemented so that his kids will not be confused when they are watching the cricket. Fair enough. Often, a good test for something that needs a change is if you can explain the status quo in simple terms to a kid. They need to get it. It is not the only test. But it is a good test. For example, I would not personally try to explain the free trade agreement to kids before deciding that it is in urgent need of a thorough overhaul. However, kids do not need to know the free trade agreement. Kids are cricket’s future fans or players. They need to understand the rules of the game. Fair enough. Nasser Hussain, said he tried to explain the Harbhajan Singh “out” decision to his kids and got his undies in a terrible, terrible knot. Harbhajan Singh was out because the on-field umpire gave him out even though replays suggested he was not out. It was a genuine case of an error in judgement; human error. Human errors happen in every walk of life. It happens on the cricket field too. This may have been an important moment for Nasser Hussain to seize to educate his kids on a very important lesson in life. Mistakes happen. We need to learn to accept them. The kids had heard a bedtime story. They went to bed. Poor Nasser Hussain though. He had gotten his underpants in a terrible knot. He had to make a late-night dash to Marks & Spencer to purchase a new pair of underpants! But, Nasser Hussain is a good man. He played the game with passion. He reminded us yesterday that he had played 96 Tests and this gives him the right to call the BCCI approach to DRS “a disgrace”! Someone should tell him that people who have played far fewer games (than he has) have called the BCCI a disgrace. I haven’t played at all and I have called the BCCI’s stand on DRS a disgrace! Nasser Hussain need not have played 96 Tests to voice his opinion on anything. The fact, however, is that he could not explain the Harbhajan Singh “not out” decision to his kids. He wants the DRS so that he can be more effective in explaining cricket’s already complex rules to his kids. This is his rationale (not his primary rationale, but an important one) for his disgust at The BCCI for not wanting the DRS. Well, if his Saturday was bad, he is probably whipping himself into a fit of uncontrollable rage on Sunday! Imagine the state of his new underpants as he explained to his kids what happened on Sunday to his former team mate, Ian Bell. The kids are asleep already, none the wiser! Nasser Hussain needs another pair of undies. Has Team India missed another “Tipping Point”? On 15 August 2007, Team India’s 2007 series in England had just concluded. Rahul Dravid was then captain of Team India — a team that had no coach and a genial geriatric as its Team Manager. The team had started off that tour with several enormous handicaps. It had a mountain of pressure on it after having been unceremoniously dumped from the 2007 World Cup. Against that backdrop, Team India won that series in England on that day. On that day, however, while celebrating that victory, I wrote that there was a hollowness to the victory. The team had refused to press its foot on the pedal in going for a victory at The Oval. Although India had won the series 1-0, a 2-0 result was possible. Instead, Rahul Dravid chose to take the safe route, secure a series victory and hand it as a “present” to players like Sourav Ganguly, Anil Kumble, Sachin Tendulkar, himself and V. V. S. Laxman — players who were unlikely return to England for another series, but more importantly, players who hadn’t tasted an England series victory in their time! Sentiment overtook a sporting “tipping point”. I wrote that day about how Team India had missed the “tipping point”, drawing reference to Malcolm Gladwell’s book, “The Tipping Point: How Little Things Can Make a Big Difference”. In that book, the author presents a thesis that (ideas and) behaviours act like outbreaks of infectious diseases that create social epidemics. The Tipping Point is the moment in an epidemic when critical mass is reached. These are “boiling point” moments. Moments that we often describe using the phrase “the straw that broke the camel’s back”. These are dramatic moments when something unique becomes common. Moments at which little changes can make a big difference. A similar “tipping point” moment was presented to Team India today against New Zealand. However, instead of going for victory, India marched on to set New Zealand an unattainable target of 617 runs in a maximum of 167 overs. New Zealand would have to score at an explosive rate of 3.7 runs per over to make the score on a 5th day pitch! The Kiwis would have to do more — much more — than just beat the 4th innings world record for the maximum number of runs scored to win a game! The Kiwis would have to smash the record of 414 set by South Africa on 21 December 2008. India batted for about an hour and a half on day-4 and consumed some 20 overs by batting on and on! I am not sure that that was necessary. Clearly, India’s approach was that protecting a 1-0 lead was far more important than pushing all out for a 2-0 series win. Especially with rain looming, which would potentially wash out the 5th day’s play, what India needed was urgency and proactive cricket. Not a safety-first approach. Now in saying this, I fully realise that M. S. Dhoni is a sentimentalist first and ruthless captain (in the Steve Waugh mould) next. To him, handing a victory to the seniors in the team would mean much more than a chest-thumping bragging-rights moment that a 2-0 victory would give him. Even so, I felt that Team India had missed another “tipping point moment” in its developmental journey. Despite the bad weather that is predicted for Wellington and despite the flatness of the track, India may still win this Test match. But by playing such defensive/negative cricket, this Team India is perhaps indicating that it is “not quite there” yet. A little difference on Day-4 would have meant “positive batting“ and “positive cricket”. The big outcome could have been, “Hey! We can do it”.